Need to get rid of leftover vegetables? 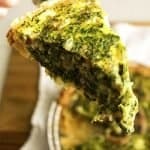 Chop them up and make this Mash Up Quiche. It’s a fast dinner recipe, or a great brunch recipe. The best part is you don’t have to throw away your leftovers! Chop any assortment of vegetables/hash browns/leftovers up and put them into a mixing bowl. In a separate mixing bowl beat 6 eggs, 1/2 cup milk, slat, pepper, and garlic powder together. Pour the egg mixture into the mashed up leftovers and mix until combined. Pour the mixed egg filling into the frozen pie crust and bake for 35-45 minutes. Make sure the filling does not jiggle to make sure the Quiche is cooked through.